May 13, 2017 - Sunny Day! 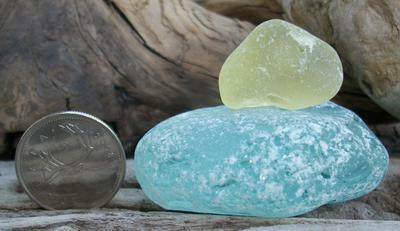 I have never seen such a giant piece of light blue beach glass, and a yellow too! Wow! Just a simple automatic camera worked fine. I love the colors of your sea glass.I haven't seen any that color.I have just recently started collecting..so much fun and so much to learn . Beautifully displayed. Definitely a winner !!! So thick of a Blue - it is so beautiful! I love the blue! I have no idea either what this could have originally been! It is so cool!